Darkwater was formed in the western parts of Sweden in 2003 and their debut album "Calling The Earth To Witness" was released in 2007 via Ulterium Records. The album was received very well around the world and the band's perfect blend of melodic and progressive metal was something the scene was craving for, and the band quickly got a loyal following. The band did their first US show in 2008 at the Bay Area Rock Fest together with Liquid Tension Experiment and Jeff Scott Soto. 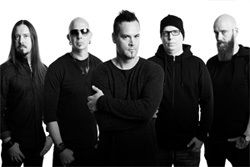 During 2009 the band parted ways with their bass player Karl Wassholm and welcomed Simon Andersson (ex. Pain of Salvation) as his replacement. In 2010 Darkwater released their second album "Where Stories End" which was mixed and mastered at Studio Fredman in Gothenburg. The album received excellent reviews and feedback, and the band played festivals like ProgPower USA, ProgPower Europe, Brainstorm Festival and more. Darkwater are now back with their new album "Human", and it surely won't leave fans of melodic metal or progressive metal disappointed! The songs are heavier, more melodic and atmospheric than before and the band worked really hard on tweaking the ten songs and over 76 minutes of playing time into perfection. Jacob Hansen (Evergrey, Volbeat, Amaranthe) was chosen to mix and master the album and he did a fantastic job which resulted in the best sounding Darkwater album to date. The lyrics of the album welcomes you into a world of you and me, how we affect the world around us and the struggles we deal with as humans. Don't miss out on "Human", a perfect album for fans of melodic progressive metal and bands like Circus Maximus, Seventh Wonder and Evergrey!